This was a super quick read. I finished it in about two days, but there was a lot to the book. I absolutely enjoyed it. I didn’t feel terribly connected to the characters, but I did feel connected to the situations and tragedies that they all were going through. Sarah Nickerson has it all – a great house, a loving husband, three beautiful children and a high-pressure job that she adores, but when a terrible car accident leaves her damaged, Sarah has to figure out how to survive and live in her new life. It’s easy to like Sarah, she’s like so many of us – busy and working towards attaining that perfect life while not always taking the time we need to just sit back and enjoy where we’re at when we have it. She has a contentious relationship with her mother and a pride streak so big that she finds it nearly impossible to rely on her mother even when she loses even the ability to see her left side. Left Neglect is a real condition that Genova documents throughly throughout the book. It occurs when a person suffers damage to the right side of the brain such as a stroke or in Sarah’s case a car accident. It makes it nearly impossible for the person to realize that they do in fact, have a left side. It’s like the left side of everything simply disappears. What I liked most about the book is that Genova doesn’t make it a scientific trip through Left Neglect, but rather shows us what that is by showing us Sarah and her life following the accident. Overall, it was a quick and very enjoyable read with a clear message: maybe, we all just need to slow down. 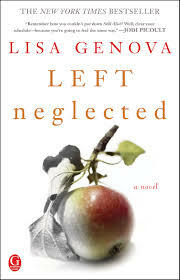 Book Information: Left Neglected by Lisa Genova is available for purchase with ISBN 9781439164631 via Gallery Books. It was originally published in 2011. A lot of the time I get from people the “I don’t know how you do it all” comment. And the truth is, I really don’t either, but I’ll give you a glimpse into what it’s really like. The dogs are snoring on the floor. My husband is snoring on the couch. Our son is in my lap nursing as I am writing. I am exhausted. I wanted to go to bed early tonight, but I also wanted to finish this last chapter. It’s the first time today that my son is quiet enough and preoccupied enough with food to let me do this without having to be walking him or rocking him or snuggling him. He comes first. Always. But in this moment, my work finally gets to come first. My son will eventually nurse himself back to sleep and I will get a good chunk of work done. I quietly get us back into bed if I am lucky, but more times than not we make it to the recliner and I hold our son as I get 2 hours of sleep before my late alarm for work will go off. I will shower and throw on whatever dress I can find and am out the door to complete my 2 hour long commute. It is now 6:45 AM. I autopilot the hour into my job, praying the entire way that there isn’t an accident that will make the entire highway a parking lot. I review over and over again the lesson I plan on teaching and where everything is in my room that I need to get together for the lesson. It is now 7:45 AM. I am at work, signed in and am setting up for the day. I have 10 minutes before the kids come in. I make sure I have everything I need and my board set up for the day. My day consists of teaching 3 block classes and attending PLC meetings or using prep time to prep for my classes. It is now 2:40 PM. I am probably in my car. I get a few seconds to breathe before I am either commuting home to take my son from my husband before he goes off to night school or I am heading deeper into the capital city to hold my office hours for my night class. I will be there until about 10:00 PM. It’s a four hour class on reading. I go through office hours, probably eat something, grade my papers, talk to students who come in and then I teach the class for four hours. Then I walk to my car and finally get to drive the hour home. I take my son from my husband because chances are he has been up and fussy all night because I am not home to lay with him at bedtime like I do or let him nurse himself to sleep. With any luck he will go down for the final time and I will either get to have some sleep myself or I will be up again writing and nursing a baby at 3:00 in the morning. It’s hard being working mom and going to school full time. It takes a lot out of you and often times, you are giving up something else in turn. For me, I largely lack a social life because my free time at the moment goes to my son and on the rare occasions that he is tired with me, we both get to have that wonderful nap that never will fully catch me up on sleep. I remember when I thought it was hard to be 20 something weeks pregnant, writing my doctoral comprehensive exam and being in bed with the flu. I laugh at that time now. That was easy when I think about it now. In June of 2015, I was on the brink of turning 29 and had just signed all the papers to become the new owner of our little house by the ocean. A week later, I would be fully enrolled in a doctoral program. I have never done things small. Today, I am on the brink of turning 32 and am about to have my first baby. Today, I have also been married for 6 months already as well! I don’t know where that time went, but it went. But also…today, I finally got full IRB approval for my dissertation study which means that this summer, as I am having Logan, I will also have to be writing the first two chapters of my paper to be ready for next school year when my data collection will begin in September. The hiccup in the entire process for me was that I needed a supervisor to sign off on allowing me to talk to teachers. It’s incredibly hard to get in touch with someone that does not work in your building and really, has no idea who you are amongst a sea of other employees too. I was getting annoyed with the entire process. However, something changed in me this year. I’m not sure what it was. I used to be someone who internalized a lot of stuff and who more often than not took other people’s issues/opinions/lack of responses as some reflection of me. The more I think about it, the more deeply rooted in my upbringing I think that all is, but that’s for a much deeper post some other time. Something did indeed snap within me this year and I just got really tired of being pushed around and swallowing how I was always made to feel mad or inadequate or wrong, what have you in whatever the situation and always by other people. So, when I saw one of the potential people at work yesterday who could very well help me in that scenario, I literally pushed my way through a crowd of children and inserted myself into the conversation he was having. I introduced myself and who I was and what I needed. The surprising part is that he knew exactly who I was and was more than happy to give me the letter that I needed. Within 20 minutes, the IRB had a digital copy of the letter they were not going to let up on and this morning as I was talking to my dissertation mentor about how I was hopeful that this meant the conditional approval would be lifted in favor of a full approval, the email came in that it was in fact, fully approved and that I was cleared for data collection come September. Sometimes you just have to push back and you’ll get what you need in order to be where you need to be. 1.) I bought a new car, but not just a new to me car, but a new car for the first time ever in my life. I know understand new cars and having power everything and things like Sirius radio. 2.) Howard Stern. I didn’t realize how much I missed him in the morning since college and 92.3 K-Rock disappeared. 4.) I achieved Scientific Merit Approval for my dissertation which means, once I pass comps in the winter, I will go for IRB approval and then I will be into full-on dissertation. I will be in total awe of myself if I actually complete this insanity in 3 years. For the first time in awhile I feel like I am at the forefront of a huge upswing and I’m kind of just enjoying the ride. It’s been awhile since I felt this way. I found Into the Wild when I was going through the last breakup I would have before I would meet my future husband. The end of the that relationship was awful, but it also made me view a lot of what my dating life had been like up until that point. I loved toxic relationships, I loved the drama, I loved choosing emotionally unavailable men. It was a dark time in my life when it came to building healthy relationships. I have no doubt that stems from earlier events in my life and perhaps one day, I’ll finally write about those. Sometimes, when I think back, I can almost pinpoint the moment that the toxicity seeped into me from my limited world around me. I just never really knew what a strong hold it took or how long it would take to get away from the causes and get it out of me. It really spoke to me and at times, when I am reflecting back on those parts of my life, I still feel like that was lesson I took away from that time and unconsciously carried with me for many years. I completely understood why a young man from a “good” family would pack a bag and disappear into the wilderness. It had nothing to do with young adulthood rebellion, but in so many ways a need for a rebirth from what he was born into. It just made sense to me and for awhile, I seriously considered putting all of my efforts into becoming an Alaskan Bush teacher. In 2014, Chris’s sister, Carine published The Wild Truth which delves deeply into her family’s dysfunction, the lies and toxicity and really shows exactly why Chris died in an abandoned bus in the Bush. I immediately had bought it and read a chunk before I had to stop to focus on my master’s thesis. I finally got to finish it today and quite simply put: wow. I can’t remember the last time that I had tears streaming down my face as I finished a book. If you thought you identified with Chris, you need to read Carine’s side of things. I felt so many things and I just understood so much of what she went through and how as an adult, it largely became her, navigating her own life and making her own rules. I highly recommend this memoir. In fact, I think I’m going to go home to day and re-watch the film adaptation of Into the Wild for the umpteenth time. Writing a dissertation is hard and it’s also expensive. It’s also terrifying how close to the end I am and how close I am to running out of funding. It also doesn’t help that I have to buy any book I need for my dissertation because I have to not only annotate it, but I also will need to have it in my possession for the next two years. I had to start an Amazon wishlist because my cart actually went over $500. If you’re feeling philanthropic and want to help me to help poor urban kids get access to the arts and better literacy skill sets, then my wish list is here. I don’t regret doing this program, but I do wish I really thought about just how expensive and just how much work this was going to take to finish. I’ve sacrificed a lot over the past two years, but it really has been worth it. Back in the tumult of my 20’s, I remember looking at happy couples and thinking, how do those people get like that? How, in this crazy world do you possibly find someone that compliments you so completely that it almost becomes like you exist in your own world with them? It really was something that was so foreign to me. In my 20’s, my relationships were often drama-fueled and with men that I never felt comfortable with. They didn’t get me and largely, I didn’t get them. I actually really hated dating and I went through large spans of time where I just didn’t. I met Phil 3 years ago on a blind date, and pretty much ever since, we have been together. It was almost like that date was only a formality too as we had been talking continuously for days before we actually met. It was an effortless click. Since then, we have become the sort of people I used to people watch in my 20’s. The sort of couples that would move around the world in their own time, in sync with one another. I hadn’t realized that we had in fact become those people over time. It started out innocently enough. We came up with silly names for one another, and then pretty soon, names for other things. Before we realized it, there was the voice. Do you the voice? If you don’t, I firmly believe you have not found the right person yet. What is the voice? It is quite simply, the voice you use only with your person. It’s probably softer, more high-pitched and your person will usually respond back to you in the same voice. It’s the beginning of the language used only between the two of you. From there you begin to name other things. Of course, these things already have common names like phone, remote, bag, etc. However, the two of you will begin to rename them and again, these things will only really make sense in the world that you are currently in. For us, I realized we had reached this point when Phil had come home from his mom’s house. He was so excited, she had given him all of these plastic shopping bags. Now, in our house these are all “Molly Bags.” So, when she had given them to him, he exclaimed something like, “Oh thank god, there are SO MANY Molly bags now,” without so much as a thought as to the fact that his mom would have no idea what a Molly Bag was. I imagine there followed the confused face from his mom along with a “what the heck are you talking about?” Phil then explaining that we call them Molly Bags because we use them to pick up her giant poops when we walk her. I forgot to share with you that a few months ago I published again with Thought Catalog. I think getting engaged has made me soft these days and the emotions over the past couple of months have been strange and weird! Has this happened to anyone else? I think I have cried, like really cried during any emotional movie I have watched. Everything seems to affect me lately, it’s so strange. It also made me go into my box of journals and unearth some gems from over the years. I got very wrapped up into the transient period of my life from 2008-2010 where I was teaching, but it wasn’t the dream yet. Where I was between New York and art and New Jersey and everything else. I was also in the midst of the fall out of the end of my first really big love. This was also when I wrote the first draft of An August Morning. Anyway. It’s strange now to look back at that period of my life and no longer feel the same way about it. I wrote this free form thinking piece: Thank You for Leaving Me. Olivia Cardin has been living her fantasy—she spends her days making art and her nights with her dreamy boyfriend, Jack, who just may very well be the love of her life. For her, everything is perfect until one August morning when Jack tells her that he just doesn’t love her anymore. Devastated, Olivia turns to her best friend Amy for comfort as she feels her new reality crashing down around her. Amy is quick to get her to her father’s ranch in Texas where Olivia will have the space she needs to recover. Only, Olivia is surprised to find out that though Jack has left her, he did leave her with a surprise gift of his own. Now, Olivia must come to terms with becoming the mother she never knew she would be, while mending her own broken heart as she builds a friendship with the shy, creative man named Keith who seems to have a stronger bond to Amy’s family than anyone is willing to admit. Can Olivia let go of her shattered fantasy and maybe even fall into true love for the first time?